An electrometer is a device used to quantitatively measure differences in electrical potential. This instrument is also referred to as a String Electrometer. This type of electrometer was originally designed by Horace Darwin and Thomas Laby and was produced by the Cambridge Instrument Company. There are many different types of electrometers. In this particular design, a fine silvered fibre is stretched between two vertically aligned metallic triangular beams. The fibre is also aligned vertically between the beams. The tension applied to the fibre is altered using the micrometer adjustment on the top of the device. The metallic beams are arranged so that the peaks of the triangles are pointing inwards to the fibre. Electrical potentials are applied to two external electrodes on the device. These electrodes are connected to the metallic beams via two 0.5 megohm resistors, one per beam. The horizontal position of each beam is altered using micrometer adjustments on either side of the device. These move the metallic beams closer or further from the fibre. When different electrical potentials are applied to the two plates, the fibre is displaced. This displacement can be observed through a microscope. 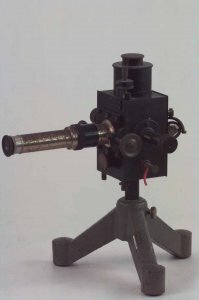 The position and focus of this microscope can be adjusted using fittings on the front of the device. The observation microscope has a scale marked on it so quantitative measurements of fibre deflection can be made. To observe the fibre, a light source is required at the back of the device. A mirror is attached for this purpose. However, any light source could be used. The magnitude of the electrical force that a particle exerts on another particle is directly proportional to the product of their charges and inversely proportional to the square of the distance between them. Thus, by adjusting the horizontal position of either beam in relation to the fibre, the effect of the potential applied to that beam can be observed on the altering deflection of the fibre. Similarly, altering the electrical potential on either beam will alter the deflection of the fibre. If the fibre is not deflected to either the right or the left, the forces generated by each beam are equal at the position of the fibre. If the two beams are equally spaced from the fibre, the potentials applied to each beam should be the same.